The present pontifical summer residence near Rome in Italy is built on parts of the ruins of the former summer residence of the Roman Emperor Domitian (51 - 96) which was one of the biggest roman villas. It was spread over an area of 14 km² from the Via Appia up to the Lake Albano which lies 293 metres above sea level. Villa Domitian was located on the western side of Castel Gandolfo's hill above the Tyrrhenian Sea. The flank of the hill is divided in several terraces. Whereas the top terrace contained servant's rooms, a cistern and bathrooms, the emperor's palace and the theatre were located on the middle terrace. Finally, the lowest terrace contained a colonnade (kryptoporticus) and two terraces. Domitian, who was the third and last emperor of the Flavian dynasty, used Castel Gandolfo as his primary residence. But his successors domiciled in other places so that the emperor's villa decayed. By and by decorations, marble and bricks were abstracted and reused for other buildings. Ancient sources accentuate the public character of the villa, which is contrasted by its function as a place of rest (the otium). This was where Domitian celebrated the annual feast of Minerva. It was organized by the members of a committee out of different groups of the population chosen by lot. On this occasion the emperor himself used to arrange pompous hunting and stage plays as well as competitions for orators and poets. Only very few among the villas of the Roman emperors dispose of such rich evidence as there is for the Villa Domitian. 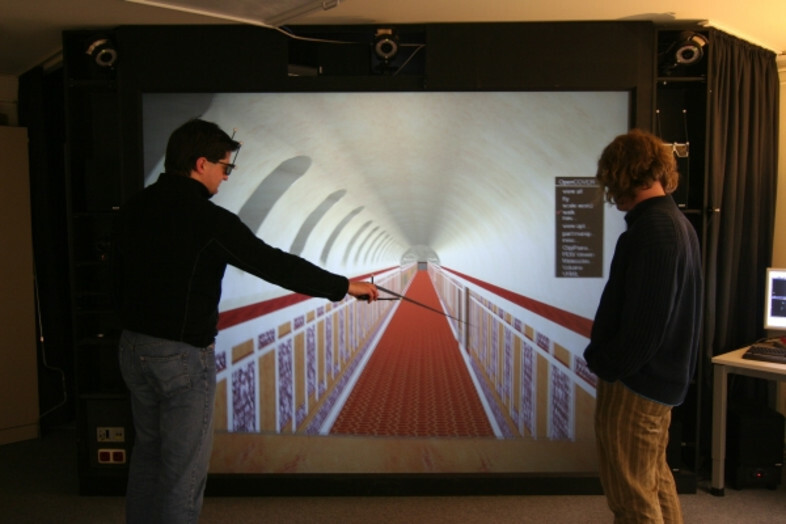 Two buildings of the villa have been reconstructed as 3D models: the cryptoporticus and the close-by theatre. The main terrace on the hillside is limited by a tremendous kryptoporticus, the highest and longest one of this kind so far known from Antiquity. Its length totals up to 300 m and is divided into two clearly different sections. The one in the south was cut into the rock for about 70 m, so that during its erection only the gaps had to be filled with tiles. 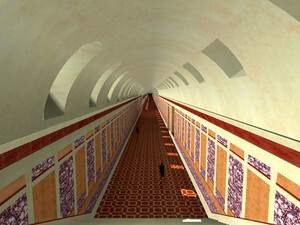 The vault is smooth and opened by two rows of 17 windows each facing each other (see Fig.1). It ended in a staircase, leading in its full width with 24 steps to a platform about 4,80 m high over ground level. So the platform preserved until our days with the great pedestal made of peperine or marble, bearing an iron cross, is situated almost precisely in the middle between the floor and the ceiling. The second section in the north, having a length of about 200 m, leant to a rock and yet is standing free for the most part of it. It was based on continuous brick walls, on the side of the valley supported by regularly arranged pillars. In between them there were openings for windows and probably also additional entrances. In front of this part there was a horizontally arranged terrace, held by a high supporting wall in the west. Imagining the kryptoporticus in function one notices the conspicuous guiding line of the light, falling from the side windows in the northern section to the upper ones in the southern part. The light is reflected in the shiny marbled walls. Such inscenation is conceivable only in context to the representation of the emperor. To the visitor the emperor and his entourage must have appeared like in a bright window of a pediment, for the sun was in the south (see Fig. 2). So this may have been the place where visitors were received and presents were distributed. 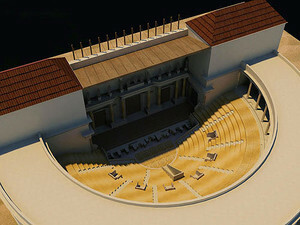 As actually usual for all Roman theatres the theatre in the albanum was composed of two parts, the stage and the spectators' round (cavea) (see Fig.3). The cavea was situated directly beside the here steeply ascending terrain. In the external round of the cavea the arrangement of the columns has to be complemented in a way forming a porticus (see Fig.4) as indicated by findings of arched blocks and draining pipes. There are two different kinds of water conduits in one of the appertaining blocks, which suggests a fountain before every other column. Miniature structures with insertions of opus sectile and water outlets assemble to miniature arrangements with columns of precious red or green porphyre. 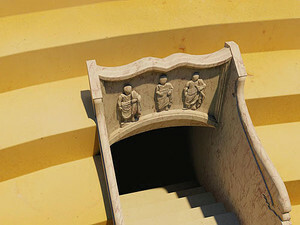 The row of seats in the cavea shows a similarly splendid ornamentation. According to the preserved rests the stair seats were coverered with slabs of yellowish Giallo Antico, the bannisters were clad with white marble and the parapets surrounding the passages leading to stairs or galleries to the corridor in the back, were decorated -- at least partially -- with a bluish Pavonazetto. Apart from this each of the passages was bound in a different manner. The reliefs above represented actors in their characteritsic garments and their masks (see Fig.9), the sides were decorated with motives from animal hunting, dolphins or griffons ending in cornucopias (see Fig.6). The orchestra was entered the usual way via both sides (lateral) corridors, the stairs or from above. From the inside passage one reached the stairs leading into the cavea and into the rooms of their substructions. The place occupied by the emperor during the performances allows for conclusions to be drawn regarding his relationship to the audience and the play. Apparantly the emperor was seated on a throne within the orchestra. Using this access he might have arrived quickly, just like the guards and the servants. He would have been part of the actions and, visibly for everybody, might have honoured the victors. To the stage belongs the pulpitum, consisting of a dense row of small columns of red porphyre, framing the niches in varying figurations. Some niches are closed and contain sculptures. None of the sculptures is preserved completely, but after all there are fragments of an Athena and presumably Appolon which are by far smaller than life-sized. The pulpitum may have had insertions of greater images from opus sectile. Among them there were scenes from fights with wild animals representing tigers. The easy connection between the orchestra and the stage given by four staircases, offered more convenience than found with other theatres. As usually found only in public theatres, a curtain prevented the insight into the stage room. At the beginning of the performance this curtain collapsed and was hidden in a canal behind the pulpitum (see Video 2). A great part of the mechanics of this device may be reconstructed from the preserved rests. In the rear was adjoined the stage facade, divided in two stories (see Fig.5). Regarding the lower one there is clear evidence again that it consisted of a combination of perfectly fitting architectural elements. This again leads unmistakably to the ground plan, in which the large door in the centre is emphasized by an isolated framing structured in like an aedicula, whereas the side doors were not expressly accentuated by the arrangement of columns. Probably there was a lively mixture of statues and other ornamental motives scattered in the upper story. So the stage resembled a conventional pattern in many aspects, the splendour of marble, though, is enhanced in many ways. Based on the reconstruction work and archaeological expertise of Prof. von Hesberg, the models were reconstructed with 3D Studio Max 9 and exported to VRML format to visualize them on the power-wall with the software COVISE (Collaborative Visualization and Simulation Environment). As only a few parts of the original buildings remained, the modelers used plans and drawings as references, rarely photographs. 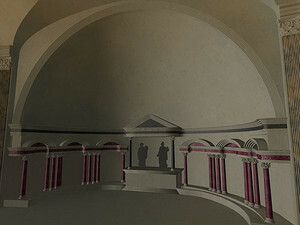 Regarding the contemporary condition of the Villa Domitian, a 3D model was considered as an adequate way of visualising the possible former state of the kryptoporticus and theatre. Moreover, the modeling process pointed out inconsistencies in measurements and caused the revision of theories. The whole progress was constantly evaluated by Prof. von Hesberg. Questions by the modelers were discussed mostly via e-mail on the basis of screenshots. For every piece a different modeling approach was used. Often the cross-section was traced from plans and then extruded or lofted. Due to the thickness of lines slight inaccuracies were unavoidable. On top of that problem, inconsistencies appeared in few cases, for instance columns permeating walls, that were solved with the advise of Prof. von Hesberg. Whereas most parts are aimed to illustrate the reconstruction, others were kept more abstract. 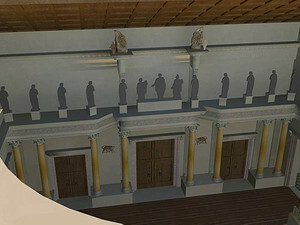 As digital models of the theatre's statues were not included in the scope of the project, placeholders indicate their positions in the theatre. 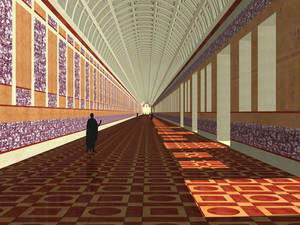 The kryptoporticus contains abstract people, whose height is meant to give a scale. The step of texturing required a search for appropriate marble textures. A long process of evaluation and adjustments was necessary to approach the original grain size and colour. Adobe Photoshop CS2 was used for editing the textures. The light set-up of the theatre consists of 3D Studio Max' daylight system which is adjusted to summer time and the coordinates of Rome. The realistic simulation of sunlight provided the opportunity to test the effects of the solar panel. 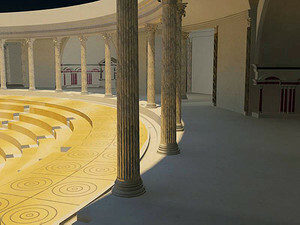 Consequently, the panel's shape was modified so that the emperor sitting in the middle of the theatre would not be exposed to the sun. However, the daylight system did not provide the needed results in case of the kryptoporticus. The interior was displayed too dark. Thus, another light setup containing several lights and raytracing was used. Moreover, some objects of the theatre are animated. 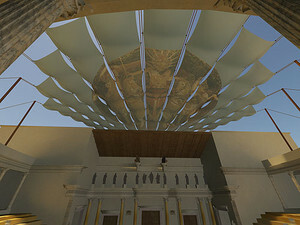 Cloth simulations were applied to the drop curtain and the solar panel. 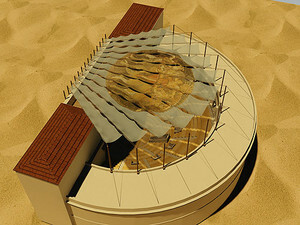 The movement of the curtain rising and dropping and the solar panel opening and closing can be viewed in Video 1 and Video 2. Additionally, a particle simulation of water fountains in the external round of the cavea is rendered as video. In the end, the final model had to be prepared for VRML-Export and the display on the power wall. 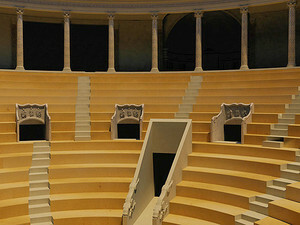 Since the especially the model of the theatre was too large, its details and the texture sizes had to be reduced. A level of detail was applied to detailed and therefore massive objects to increase performance while preserving details for close views. The models are stored at the Chair of Computer Science Prof. Dr. Ulrich Lang in the Computing Centre Cologne. Students and scholars can visit the building to study the model in 3D on the power wall.